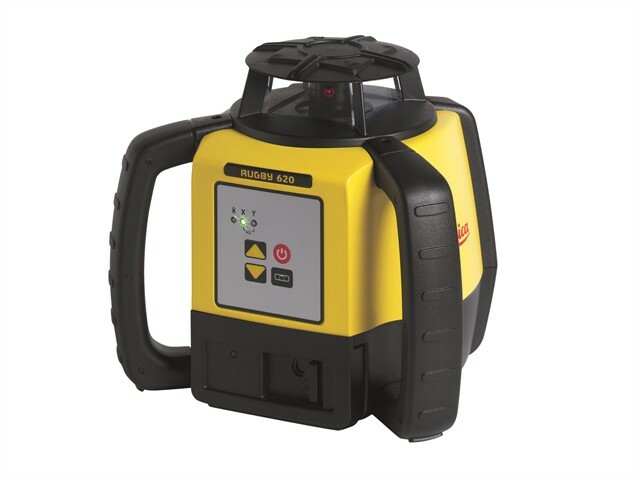 The Rugby 620 is a one button laser which works perfectly for horizontal levelling tasks such as concrete forming, surface levelling, setting foundations and footings etc. Incredibly accurate, the deviation from level should be no more than ± 1.5mm over a 30m distance. Supplied with a Rod Eye Basic laser receiver which extends the laser’s use beyond the visible range up-to a 600m diameter. Powered by a long-lasting Lithium-Ion rechargeable battery pack which is extremely robust and allows more than 40 hours of operation per charge. All Leica Rugby products are covered by their PROTECT warranty service which provides lifetime manufacturer’s Warranty against defects as a result in manufacturing. Manual slope matching, up to 8% in single axis. Accuracy: ± 1.5mm @ 30m. Dimensions: 212 x 239 x 192mm. Protection Class: IP67 Dust/Water Proof.